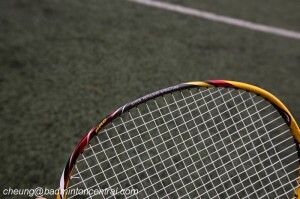 Kumpoo were kind enough to send me sample racquets for testing, one of which was the Power Shot Nano 2700 II. 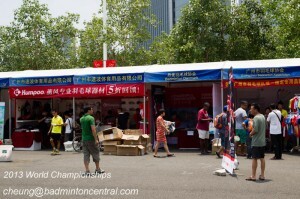 So far, I haven’t seen Kumpoo racquets stocked in shops in Hong Kong. The racquet was placed my geographically closest and regular stringing store, which was MBS (MyBadmintonStore), and strung at my expense. 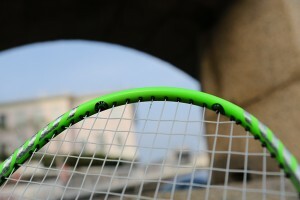 The racquet was strung at 26lbs with Yonex BG66 with the racquet having a 72 hole stringing pattern with shared holes. I took the racquet down to one of my very non-regular venues. 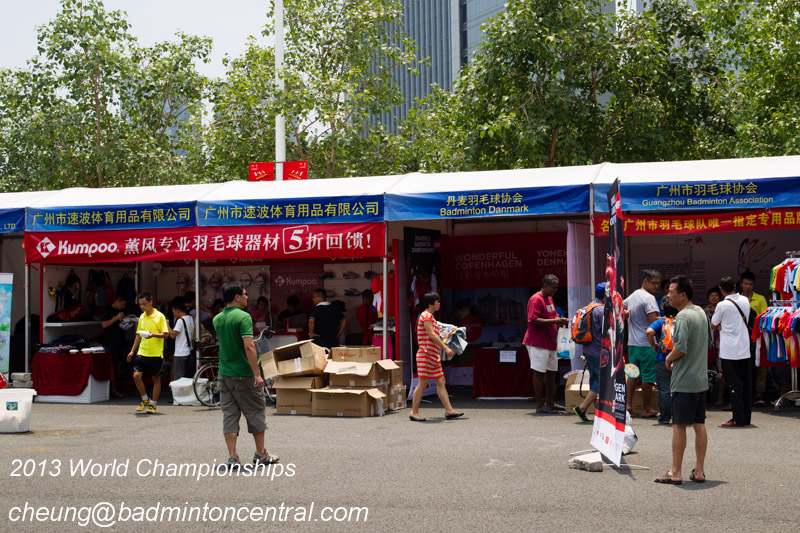 It was there that my spiderman senses started tingling as I saw an acquaintance with some racquets that didn’t look like the regular dominating Yonex emblem. Sure enough, it was a range of Kumpoo racquets. After getting over his shock at seeing me carrying a Kumpoo racquet (was it the racquet or my appearance), he explained he had only very recently signed up with Kumpoo as the distributor. Hence, he was plastered with Kumpoo products. The Power Shot Nano 2700 II is part of the present range of four hexagon shaft racquets. Rather than a fully circular shaft, the shape is designed on a hexagon. Kumpoo tell me the 2700 II is very similar to the 2300 II but slightly more for offensive play. The Power Shot Nano 2700 II has a slightly dark yellow colour with black accents and a dash of red. At the lower end of the shaft, there are some black accents indicating the hexagonal design. 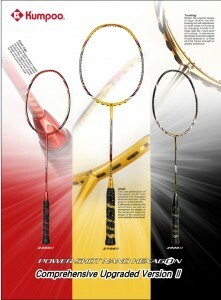 The Power Shot Nano 2700 II gives every impression of being a solid, robust piece of a badminton racquet. The manufacturers claim it to able to withstand a stringing tension of 35lbs. Although I didn’t string it to that tension, the racquet certainly feels robust and solid enough to tolerate 35lbs. I didn’t specifically test racquet clashes (!) but there is the distinct feeling that other racquets would come off second best. Swinging it around, the racquet makes no pretenses of subtlety –instinctively you know you will get a solid weight through the shuttle. 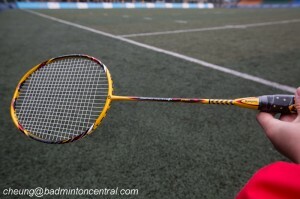 I would rate this racquet as being stiff with a head heavy feel to it. Just doing practice clears are pretty effortless. You can get a nice punch into the shuttle and it can go high and deep pushing the opponent off the centre area. 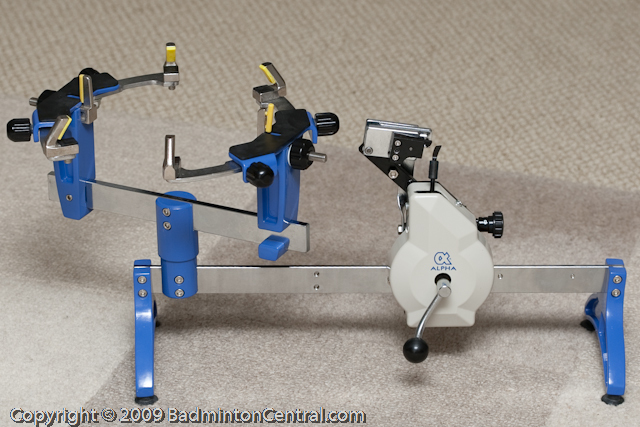 Does the hexagonal shaft really decrease torsion of the racquet and increase the strength of the racquet? It is difficult to judge whether it is the design of the racquet or the materials used that gives it the stability and strength. Smashes – I would rate as good with a slight head heavy weight behind the shuttle. However, users will need to be careful about technique. Due to its head heavy distribution and stiffness, it was harder to hit 3 or 4 quick smashes in a row in a doubles smash routine – something I attribute to a slow preparatory phase in my technique (i.e. it’s me and not the racquet). 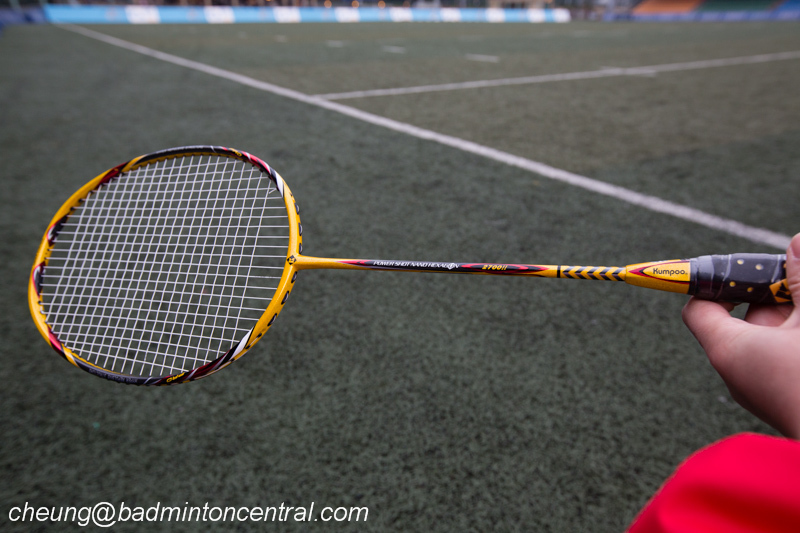 You need to be strong to use this racquet. After a full strength smash routine, I did feel a twinge in my elbow where I previously had medial epicondylitis. My arm has been de-conditioned but it does demonstrate that one has to have some patience in adjusting to the different characteristics of the racquet. Damping was good with little vibration travelling into the arm. Drives – in some ways the slightly head heavy and stiff shaft gives a doubles player advantages and disadvantages. You get a better smash but drives need to be more controlled. You can get a great drive and great response using a very short action technique but it might be a bit tricky to get it exactly right. If your drive technique has a big swing component in it, recovering for a third or fourth drive will hard against very fast opponents. The 2700 II is a fine piece of equipment and one that is built to very high standards. 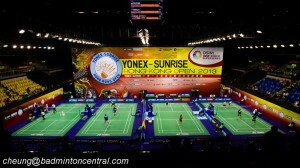 In my mind, it will probably be more suited towards the singles player or the advanced doubles player. 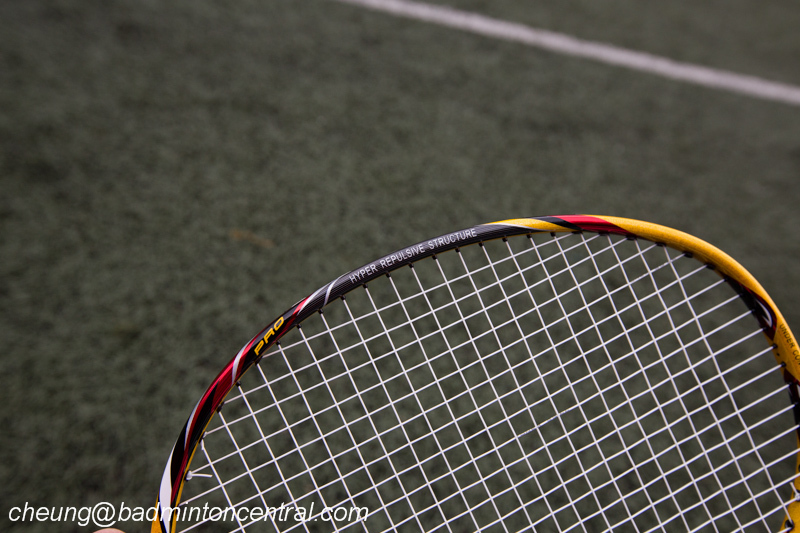 It does take a little time to get used to but if you have a stronger arm, short preparation, fast swing, and train regularly, you would adjust pretty quickly to this racquet.